Like anyone who does it with intent, I often find writing frustrating. And one of the things I find most frustrating, particularly when I’m working for long chunks of time, is the way in which my literary imagination folds in on itself: I use and re-use the same words, the same sentence constructions, the same logical configurations to the point at which my distaste for the way I make a point gets in the way of the point being made. It’s an unpleasant way to engage with oneself and its not conducive to deadlines. On the other end of the scrivener’s spectrum, however, there are those words and phrases that afford me a particular thrill when I am able to massage them into a paragraph. Usually, its something a favourite author or critic has used, something that makes me feel particularly erudite when I am able to smoothly and confidently use it as a vehicle to convey my own ideas. Integrating a particularly canny phrase into a sentence hits the same pleasure centre in me that’s triggered when I level-up a character in a video game. Its like levelling-up my article: (perceived) Wisdom points increased +10. With both the frustration and the pleasure of writing in mind, I’ve put together a game of Writing Bingo. It works just like regular Bingo, but the spaces are filled with the favourite words and constructs of my writer friends and colleagues. The goal is to (comfortably) incorporate the words and phrases on the board into your own writing. Try to fill as many different Bingo patterns as you can. Use the card when you are feeling particularly mired in your own writing to help you break out of the restraining architecture of your prose and find pleasure in craft. Nobody cries at bingo. Dawn Dumont taught me that. I think you will find that working with an unfamiliar construct (B1, “in and through,” was a new one for me) will help you to process your thoughts and arguments in unexpected ways. If it seems artificial, give up your idealist pursuits of the pure idea and think of writing in the terms of Pascal’s formulation for prayer: “I don’t pray because I believe, I believe because I pray.” As academics, we don’t write because we have an idea, we have an idea because we write (it’s an oversimplification, but a productive one if you’re stuck). 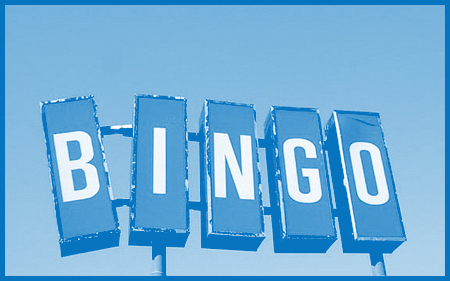 All the words and phrases included in Writing Bingo have been contributed by professors and grad students in the Social Sciences and Humanities. They are the constructs loved (and hated) by people who write almost every day. While a phrase like “in this precise sense” may be abhorrent to one, it may be the beginning of a beautiful paragraph for another. I encourage you to start a game with others in your office or cohort. Set up some prizes (beer to be a good one). If you get a Bingo, please add your pattern to the comments below so we can track the data (sorry, I can’t help it). I’ve also included a blank grid if you want to make your own. Click writing bingo for the PDF. Good luck writing. May the letters be ever in your favour.